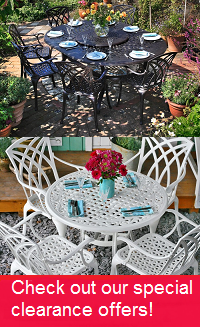 Due to popular demand we opened a showroom in May 2012, in Terminus road, Chichester, West Sussex, PO19 8TX. 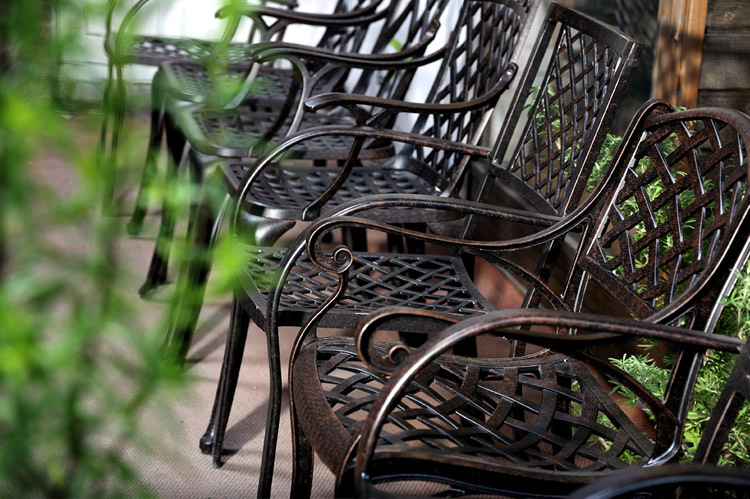 We are receiving regular interest every week from customers wishing to come and have a look at our garden furniture prior to purchasing. 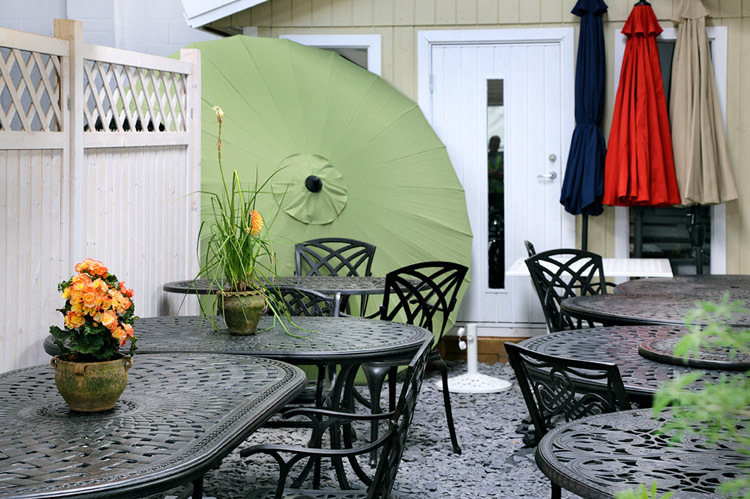 When visiting the showroom, more than 95% of our visitors ordered their set there and then. We have a small amount of clearance stock which you can see in the showroom. 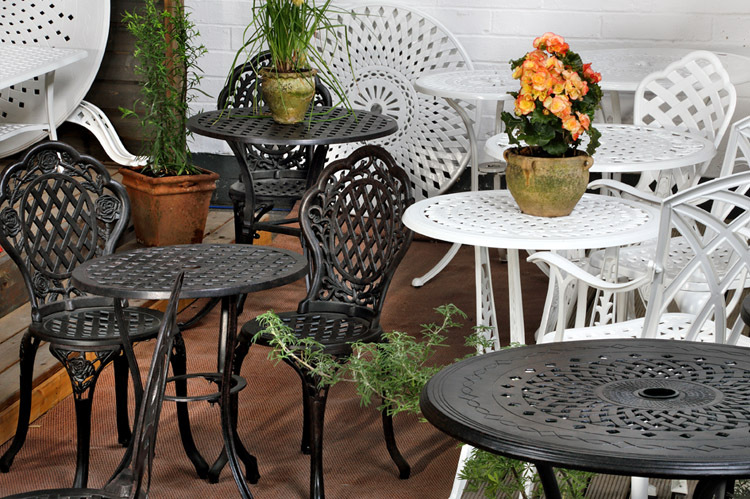 For example a chair or table that has had a small scratch and has been carefully repainted, hardly noticeable to you or your guests, but offered at a decent discount to the normal price. Most of our clearance stock is sold when the customer is able to see that the goods are effectively as new. 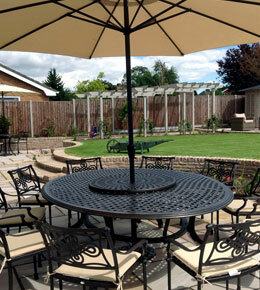 So if you are looking for a great deal it will definitely be worth booking an appointment to visit our showroom. Please advise us when you would like to pop in and what sets you are interested in. Many of our customers drive from far afield to visit us so we’ve decided to compile a list of our local attractions and favourite places to see. 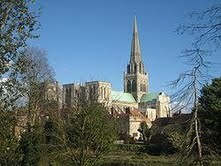 Under a mile away from our showroom, the historical and picturesque town of Chichester is within easy walking distance and well worth a visit. Boasting stunning British architecture such as Chichester Cathedral and the Market Cross, the friendly city of Chichester offers much to see and do. Much of the city centre is pedestrianised offering great shopping and a wide selection of individually owned cafes and eateries. Cultural places of interest include the Chichester Festival Theatre, Chichester Cathedral, Bishops Palace Gardens (situated at the back of the Cathedral), Priory Park and much more. There is a farmers market every Friday by the Market Cross, and a food and clothing market every Wednesday and Saturday at the end of East Street. Goodwood, renowned for its horse racing and motor circuit, is a ten minute drive away. Within the estate grounds, the sculpture park (http://www.goodwood.co.uk/goodwood-estate/sculptureestate/sculpturepark.aspx) is well worth a visit. The estate offers a wide range of activities, from delicious locally sourced food served in a number of eateries on the estate to its lovely hotel and spa with its golf course and other leisure attractions. There is also a friendly farm shop on site which offers a range of locally grown and homemade produce – including locally made cheeses and organic ales. The beautiful Village of Bosham is a 10 minute drive away, offering stunning waterside views with a tidal quay. There is a strong sailing culture there, as well as some lovely cafes and art galleries, including the art and craft arcade, Bosham Walk which sells local crafts and produce. Immersed in history, it was from Bosham Quay Meadow that Harold sailed for Normandy in 1064 and both Harold and Bosham church are shown on the Bayeux tapestry. Legend has it that King Canute ordered the waves to retreat from Bosham. 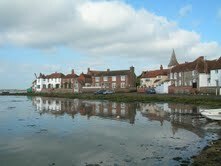 Canute was said to have lived in Bosham and it could likely be that his daughter is buried in the church here. The natural and unspoilt sandy beach of West Wittering with the highest water quality and excellent facilities is one of the premier Blue Flag beaches in the country. The beach has been awarded the EC Blue Flag for water cleanliness and a Beach Award from the Tidy Britain Group for the facilities and cleanliness have been awarded to the beach which has been popular with both locals and visitors for generations. This gem on the South Downs, rescued after a major fire in 1989, houses an elegant Georgian interior with a famous Grand Tour collection. An 18th-century dolls' house with original contents, is one of the highlights. The complete servants' quarters in the basement are shown as they were in Victorian days when H. G. Wells' mother was housekeeper. The beautiful and peaceful garden is now fully restored in the early 19th-century Picturesque style, in a downland and woodland setting. Is one of the largest areas of ancient chalk downland cared for by the National Trust. Of historical interest is an Iron Age hill fort and cross-ridge dykes. The remains of a Napoleonic war telegraph station can be found on Beacon Hill, the highest point on Harting Down. Rescued buildings - Historic buildings rescued from destruction: if they weren't here they'd be ashes and dust. Houses and cottages spanning ten centuries, and many other buildings, including barns, a watermill, a market hall and a school — but sorry, no pub! Rural life collections - Carts, wagons and farming implements, and the tools of many different trades. Join the 1.30pm daily tour to go behind the scenes in our artefact stores. Animals - Shire horses and Sussex oxen which work every day, South Down sheep in the fields, Tamworth pigs in the woods, geese in the orchard and hens everywhere! When the horses are resting you can meet them - three Shires named Neville, Mac and Major.